The bombing of the Alfred P. Murrah Federal Building in Oklahoma City was one of the deadliest acts of terrorism in American history. Since Andrew Jackson image is on the $20 bill, some areas in Oklahoma do not accept the bill. The state of Oklahoma is located within the Southern Central area of the United States and is the 20th ranked most extensive state with a total land area of 69,898 square miles, as well as the 28th ranked most populated state with a total population of 3.79 million as of 2011. 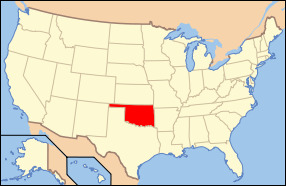 The state has the nickname “The Sooner State” and was the 46th state to be admitted into the United States. Oklahoma is a major producer of oil and natural gas along with agriculture. The economic foundation of the state is largely based upon aviation, telecommunications, energy, as well as biotechnology. The state has one of the most rapidly expanding economies in the country, with Tulsa and Oklahoma City being the core of the states economic anchors. The state lies in the Great Plains as well as the Interior Highlands which is often times exposed to severe weather. The state is located with a temperate area and undergoes occasional temperature extremes in its continental climate. A large portion of the state is in a zone known as Tornado Alley which is known for its frequent exposure to cold and warm masses of air which result in severe weather. The major industries in the state of Oklahoma include wheat and cattle farming, natural gas, as well as oil. The major bodies of water within the state are the Arkansas River, Red River, Canadian River, Eufaula Lake, Lake Texoma, Lake O' the Cherokees, Hudson Lake, Oolgah Lake, Gibson Lake, and Keystone Lake. The highest point of elevation in the state is Black Mesa which peaks at 4,973 feet above sea level. The state has 77 counties and is bordered by Arkansas, Kansas, Missouri, Colorado, Texas, and New Mexico. The state bird is the Scissor-Tailed Flycatcher, the state animal is the Buffalo, the state fish is the White or Sand Bass, the state flower is the Oklahoma Rose, the state tree is the Redbud Tree, and the state grass is Indian Grass. Give the fact that Oklahoma is has such a rapidly expanding economy, it will surely remain a key player in the overall economy of the United States.